When couples choose wedding and engagement rings, they look for symbolism that matches their relationship, personality, and style preferences; for many brides- and grooms-to-be, Irish Claddagh rings - romantic designs imbued with a rich cultural tradition - are the perfect choice. Though there are no definitive records that document the origin of Claddagh rings, they are named for the fishing village of Claddagh, just outside the city of Galway on Ireland's west coast. The story of the rings began over three centuries ago, when a man named Richard Joyce was supposedly captured by Algerian pirates on his way to plantations in the West Indies. While he was imprisoned, he learned the goldsmithing trade, and crafted the first Claddagh ring in honor of the love of his life whom he'd left behind in Galway while he sought his fortune. Years later, when he was freed, he returned to Ireland, discovered that she'd never married in remembrance of their love, and he presented her with his new design. Naturally (as is the way with folk legends), they lived happily ever after. The Claddagh is composed of three symbols: the centralized heart represents love, the hands holding the heart represent friendship, and the elevated crown represents fidelity and loyalty. These are highly desired characteristics for a marriage, making a Claddagh ring the perfect choice for a couple committing their lives to one another. 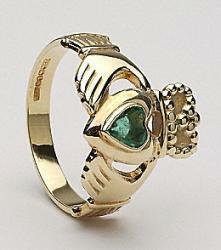 Claddagh symbolism is also revealed in the way the ring is worn. Traditionally, if the ring is worn on the right hand with the heart pointed outward, it means the young lady is not in a committed relationship but she is looking for someone to complete her heart. Worn on the right hand with the heart pointed inward, the ring symbolizes that there is a budding relationship, perhaps even a committed one at hand. On the left hand with the heart turned inward, the ring represents marriage just as would a more traditional style of ring. Less frequently seen are Irish rings worn on the left hand with the heart pointed outward - typically, such a placement would symbolize nothing or perhaps widowhood. Claddagh and emerald engagement ring. Though the overall design of a Claddagh engagement ring allows little room for style preferences, there are ways to embellish the ring without disrupting the traditional symbolism. Many couples choose to add diamonds or emeralds as accent stones centered in the heart or crown, and the surrounding bands can be detailed with Celtic knots, additional gems, or metal detailing. The rings may be crafted from a variety of metals, including gold, white gold, and silver. Initials and dates are frequently engraved in rings for a personal touch. For even more ideas, couples should browse Claddagh ring photos to see both traditional and contemporary styles. Many Irish rings are passed on as heirlooms for generations, but it is possible to buy them in a number of locations, especially since the popularity of the rings has spread extensively through travel and immigration. 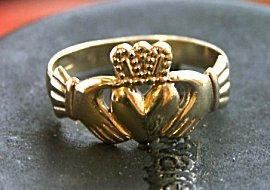 Antique Claddagh rings may be found at estate sales, pawn shops, or vintage jewelers. New variations are available from ethnic metalsmiths and jewelers, online auctions, and online jewelers. With a simple, elegant design coupled with a rich cultural tradition, Claddagh rings are perfect symbols of love, fidelity, and friendship that apply to every culture. Often used as friendship, promise, and engagement rings, Irish rings are popular today with people of all ethnic backgrounds who share a commitment to romance and tradition.